The Guide Dogs for the Blind puppies posed for photographs during a trip to the Centre which is hosting ‘Curious Creatures’ from 10am until 5pm on Sunday 8 November 2015. 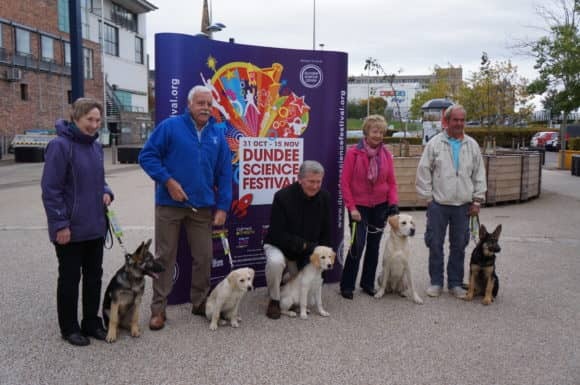 Visitors to the Dundee Science Festival event will have the chance to watch a typical Guide dog puppy class, hear from the volunteers, meet the guide dog puppies and have a go at sighted guiding. In addition to the puppies, visitors can meet creatures from throughout the world. Thanks to Dundee-based Eden’s Garden, animal handling sessions will be held throughout the day, with an array of animals from all six continents – a chipmunk, chinchilla, African Pygmy hedgehog, bearded dragon, Russian tortoise and Chinese water dragon. Meanwhile, there is the chance to discover the weird and wonderful world of rock pools with RSPB Scotland, fish for some seashore creatures in a mock rock pool, and get creative with marine themed crafts. Finally, University of St Andrews scientists will be demonstrating how animals and humans achieve different temperatures and revealing (almost!) everything there is to know about birds’ nests – you can even build and bring one home! Booking for ‘Curious Creatures’ is essential – please telephone (01382) 228800. Normal admission costs to Dundee Science Centre apply. Now in its sixth year, the 16 day celebration will descend upon the city from Saturday 31 October through to Sunday 15 November 2015 and, with the support of Scotland’s Year of Food and Drink, promises fun, entertainment, inspiration and curiosity for all ages in the shape of over 40 events.